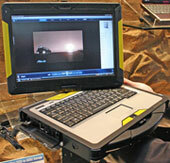 Asus showed off a prototype of the Asus Rugged Military NB to CNet Reporters, earlier this week at CeBIT. This rugged laptop/convertible (Tablet PC functionality with a physical keyboard) is designed primarily for users in the military and complies with the IP 54 standard in regards to the chassis being sealed against dirt, water, etec. Details are sketchy at this point, but what is known is that it has a 13.3-inch widescreen, touch-sensitive display (no word on whether it will be a touchscreen or digitiser w/stylus). It also has built-in GPS capabilities, and a fingerprint/biometric reader for security. Note: This is not to be confused with Asus’ new “convertible” UMPC, the T83. This entry was posted in Announcements, ASUS, Rugged, Tablets. Bookmark the permalink.